Mysore city of Karnataka is the second largest city of this state and an important stopover in the itinerary of a tourist who is on his tour of south India. It is the hub of culture and heritage of Karnataka and is a burgeoning town in terms of technology and trade. Lots of palaces and temples strewn around the city speak volumes about the heritage and architecture of the ancient times and the kind of benefaction the city received from its rulers. This town has never failed to impress its visitors as it is home to some of the finest tourist sites and the most popular among the tourist attractions in Mysore is the Chamundi hills that house the Goddess Chamundeshwari temple. Mysore is also known for its sprawling gardens and Brindavan garden is the most prominent among them. It showcases a variety of flowers and in the evening the entire park comes alive with musical fountains and multi-colored lights, exuding a heavenly ambience. You will be impressed to feel the historic charm that still lingers in this town and there are many historical sites also that can be visited here. The Mysore Palace is a must see for the tourists on their trip to Mysore which is an exemplary instance of the Indo Saracenic style of architecture. There are many other things to watch in Mysore and some of them to mention would be St. Philomena's Church, Mysore Zoo, Jaganmohan Art Galary Jayalakshmi Vilas, Rajendra Vilas, Karanji Lake and Kukkarahali Lake. Apart from Mysore you can also plan a tour to the nearby tourist destinations that equally deserve a visit. Some of the prominent ones are Somnathpur, Belur, Halebid, Bandipur, Ranganathittu and Sravanabelagola. While touring this place don�t forget to taste the mouthwatering cuisine of this place. Rice is the main ingredient of the food and sambar, idlis and bonda are some of the dishes that you can relish in the various hotels and restaurants of the city. With substantial footfall each year, there are many lodging options available in Mysore. From the heritage to budget class, you can choose any category that suits your pocket the best. The heritage hotels are Green hotel and Lalitha Mahal Palace Hotel. The deluxe hotels are Hotel Regaalis (Southern Star), Hotel Royal Orchid Brindavan and Metropole. Economy hotels are Hotel Ramanashree, Taj Ginger Hotel and The Viceroy Hotel. Being the second most important town of Karnataka, Mysore has excellent transport network that allows the tourists to access this town from distant corners of India. The nearest airport is in Bangalore that connects the major towns like Delhi, Mumbai, Chennai, and Kolkata apart from the nearby destinations. Mysore has a railway station from where the regular train services connect the city with the other towns of India. The road network including the state and national highways is equally efficient. 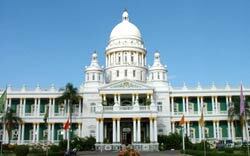 Know more about Mysore by clicking on to the site touristplacesinindia.com, which offers valuable travel information on Mysore.